Let's wish our moms a very happy day! On the occasion of Mother's Day, students of the PS / MS present the final product of their project entitled: discover the colors with the three painter mice. KG1 AND KG2 Students presented their Christmas songs recital to their families and the school’s teachers. A fantastic orchestra accompanied the choir that sang the beauty and spirituality of Christmas. A nation's heritage is a fundamental pillar of its cultural identity. To end the year, preschool students invited their parents to join them in the adventures of the king who wanted to choose an heir to his throne: A person who is characterized by exceptional beauty. How? It is the beauty of the soul that dominates the external one, a beauty driven by careful listening and a heart open to others. 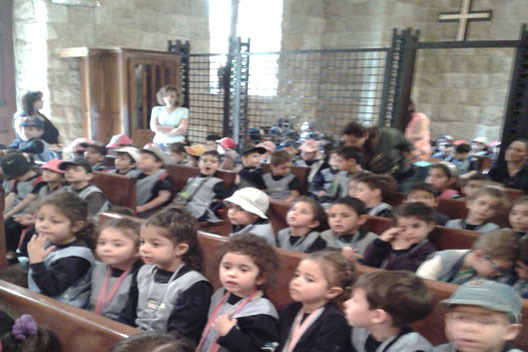 Students of Paradis d’Enfants Ghosta have visited the Virgin Mary site at Tabrieh Wata El Joz. They offered her their intentions, carols and flowers. KG2 students invited their mothers for breakfast and made them taste delicious meals prepared by them. Prior to that, they presented dances and songs to celebrate this day dedicated to their mothers. 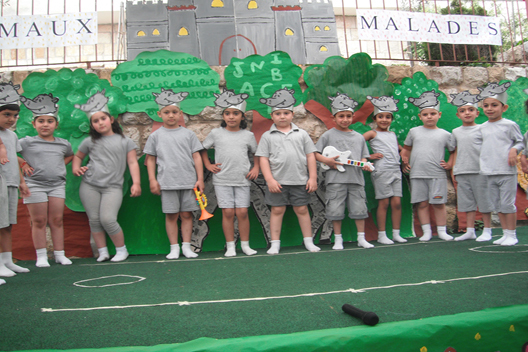 A recital was presented by KG1 and KG2 students to their parents. They sang Christmas with their angelic voices and made us experience the birth of Jesus. Let us sort our trash at home, in our neighborhood and in the streets to save Lebanon and bring it back to life. The Children have marked the celebrations by focusing on the beauty of the world we live in. An issue arises: this world begins to lose its humanity. How do we get our values back? The answer lies in the fable by Jean de la Fontaine that was performed by our little students. The moral of this tale is relevant for both children and adults: "Weak or strong, we all are equal. Let us be honest with one another". Visit to the Blessed Virgin Mary. Preschool glory with joy and from the bottom of their heart the Mother of Jesus at the church of our Lady of the Fields. They offered intentions and flowers with great love. Following the visit, a picnic was held in the monastery garden. 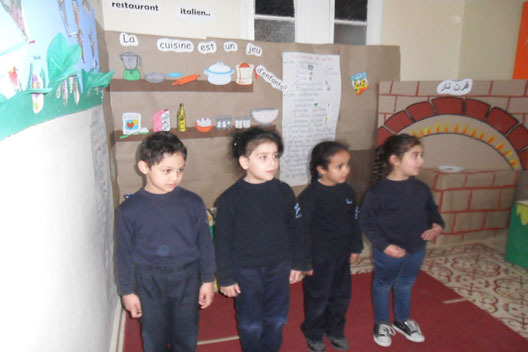 To celebrate Mother’s Day, Paradis d’Enfants KG2 students invited their mothers to an Italian restaurant to enjoy the recipes prepared by their hands.